The background to the Texan Revolution is simple. Mexico had allowed American immigrants to settle in relatively remote and empty Texas. Preoccupied with its own revolution, the native population was soon outnumbered by the immigrants, many of whom were from the southern states, so they wanted to continue their practice of slavery even though it was illegal in Mexico. More important, this was the Age of Expansion. Americans were used to settling and absorbing an area, regardless of what the original population thought, so conflict was inevitable. After a series of confrontations, open warfare began in October 1835 and the rebels had gained control of Texas by early December. Believing that the Mexican government would not be able to respond until spring, attention shifted from building an army to debating whether or not to declare independence. However, Santa Anna moved faster than expected, and his army appeared in Texas in the middle of winter, besieging the Alamo in February 1836. 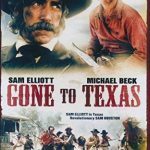 Sam Houston (Joel McCrea) enters Texas in 1832, after he suddenly resigned as governor of Tennessee following a scandal where he had left his wife after two days of marriage. 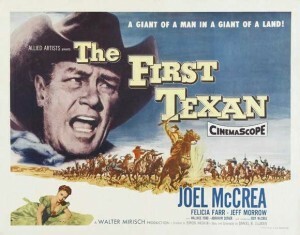 When Houston arrives in San Antonio, Jim Bowie (Jeff Morrow) attempts to recruit him into a secessionist conspiracy, but he has left politics behind him. Settling in San Antonio, Houston falls in love with Katherine Delaney (Felicia Farr), the niece of his landlord. As tensions rise, Houston talks Bowie out of a sudden revolt, pointing out that General Santa Anna (David Silva) wants an excuse to take over the Mexican government, and they should organize an army before they revolt. Hoping for a peaceful life, Katherine makes him promise to stay out of any revolt, but Davy Crockett (James Griffith), one of his oldest friends, appears with a message from President Andrew Jackson (Carl Benton Reid). Houston rides to Washington, where Jackson explains that he wants Texas to revolt, become a republic and then vote to join the Union, and convinces Houston to lead the revolt. However, Santa Anna has already declared martial law and sent troops into Texas, so Houston has to rush back to Texas to take command of the rebel army. Oh dear, there are many historical errors in this film. In the movie, Houston’s wife left him after two days of marriage, but it was actually three months. The script conveniently forgets to mention that Houston had spent the following years drinking. Ashamed of his degeneration into a drunk, Houston’s Cherokee friends replaced his previous name Raven with a new name, Big Drunk. It would have been difficult for Houston to marry in Texas, since he had married Diana Rogers in May 1830, while living with the Cherokee. The marriage had ended when he left for Texas in the fall of 1832, looking for a new start, like so many others. Officially, he traveled to hold negotiations with the Comanche, but his true purpose was to investigate the situation for Jackson, who hoped that the American colonists would rebel and bring Texas into the United States. Houston is described as the first American lawyer in Texas, but William Travis (William Hopper) had already built up a thriving practice. The real Houston became a Mexican citizen on April 21, 1835 and most of his legal practice consisted of serving as a character witness for Americans applying for Mexican citizenship. So far the errors have been relatively trivial, but Joel McCrea’s portrayal of Houston is completely false. Throughout the movie, Houston insists that he has left politics behind him, and only agrees to lead the revolution when President Jackson informs Houston that it is his destiny, which seems fair enough, it is his destiny after all. However, the real man had not been in Texas for long before he started telling anyone within earshot of his plans to arrange the American annexation of Texas and then use it as a springboard to become governor, senator and finally president. By the way, it is unlikely that Davy Crockett would have delivered any messages for Jackson. Admittedly, Crockett had worked with Jackson’s political machine early in his political career, but relations between the two men had degenerated to the extent that Crockett referred to Jackson as a dictator and had joined forces with the Whigs to oppose Jackson’s Democrats. Jackson did not take the attacks lightly, and he backed a candidate who beat Crockett in the congressional race. That defeat drove the real Crockett to go to Texas in search of another start. The script created a conspiracy to secede from Mexico, presumably for dramatic effect. The conspirators include Jim Bowie, William Travis, Bowie’s father-in-law, James Fannin and Stephen Austin. Once again, it is not true. While there was a secessionist movement, there was no conspiracy. Debates about secession were public, and usually loud, especially after sufficient whiskey had been consumed. In fact, Travis and his partner Patrick Jack were arrested for trying to form a militia company. Also, Bowie’s father-in-law was never an advocate of Texan independence, and Austin had made such an effort to become Mexican that he signed documents as Estefano, not Stephen, at least until he was thrown in prison. However, these deviations from the historical record are relatively minor when compared with Jackson’s plan. Jackson refuses to send troops to intervene in the revolution because he would not lead the nation into another war, which sounds noble but it is not exactly true. Actually, he had no choice in the matter. Congress would not vote for war, and he feared that Britain and France would use American involvement in the revolution as an excuse to intervene. The idea that he wanted to spare the nation the horror of another war is laughable, Jackson rode his victory at New Orleans during the War of 1812 to the White House. The film’s general chronology of the Texan Revolution is correct, at least the dates are correct, but everything else is inaccurate. In the movie’s version of events, the Texans merely fire a handful of shots to drive the Mexicans out of Texas. Admittedly, the initial revolt succeeded with surprising ease but there were several battles. In particular, the siege of San Bexar (the location of the Alamo), the final Mexican stronghold, was quite bloody. Houston is signing the declaration of independence when news arrives that the Alamo has been besieged by Santa Anna. Learning that the garrisons of both the Alamo and Goliad have been massacred, Houston recognizes that his small force can not face Santa Anna’s much larger army, so he retreats, which is criticized by his officers. Even Katherine tells him that she wants him to fight, unaware that he had already decided to lure Anna into a trap at San Jacinto. Turning around in the dark, the Texans catch the Mexicans just when they are about to have breakfast. Unaware that the Texans are nearby, the Mexicans are taken completely by surprise, and hundreds of Mexican soldiers are killed. Taken prisoner, Santa Anna is forced to sign a treaty ordering his armies to leave Texas in exchange for his life. The script gives an accurate portrayal of Santa Anna’s campaign, including the widespread unpopularity of Houston’s decision to retreat. And it is true that Santa Anna’s capture, not the victory at San Jacinto, ensured the success of the Texan Revolution. However, the real Santa Anna had pursued the retreating Texans with only part of his army, hoping to gain the glory of the final victory for himself. Finding the Texans waiting at San Jacinto, Santa Anna had dug in and waited for for reinforcements. 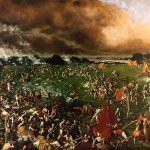 A day later, the Mexicans became overconfident and took an afternoon siesta behind their defences, only to be woken up when hundreds of screaming Texans broke through, seeking revenge for the massacres at the Alamo and Goliad. Despite the fact that Anglo resentment about the Mexican government’s ban on slavery was a key factor behind the drive for secession, there is no mention of slaves, or even any appearance of black people, throughout the movie. McCrea’s portrays Houston as way too polite, mild-mannered and sober. And lifeless. To be honest, I never was a Joel McCrea fan, I always preferred Randolph Scott. The movie is so lacking in energy, I wonder why they bothered. It was made a year after The Last Command, which ended on a depressing note with the fall of the Alamo, so presumably the producers wanted to show the Texan victory. Very, very, very boring. I need to review better movies.